Chinwag lets you share comments with other players while you're playing Chihuahua. 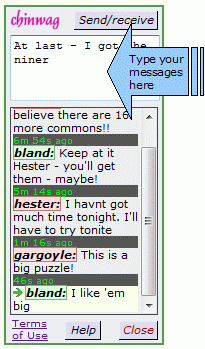 If a puzzle has Chinwag attached to it, the comment board will be on the right of the screen, above the Forum Latest panel. It's your choice whether to have Chinwag open or not. The picture on the right shows the panel with Chinwag closed. To open it, click on the Open button at the bottom right of the panel. When Chinwag is open, there will be a Close button at the bottom right. Each message can contain up to about 200 characters (including spaces). Type your message into the box under the chinwag heading. When you've finished typing a message, press Enter on the keyboard, or click the Send/receive button above the message. You can update the comment display by clicking Send/receive without typing a message. The display is also updated automatically from time to time while you're playing the puzzle. Messages are displayed with the latest at the bottom. When the display is updated, new messages are shown with an arrow. If you move the mouse pointer over the top of Forum Latest, you should be able to drag it up or down, to adjust the way the space is distributed between Chinwag and the Forum summary. You can scroll up to see older messages - if necessary, click on the "Get earlier messages..." link at the top of the messages. Each player's name is shown with a different colour behind it, to make it easier to see at a glance which messages are from the same person. The colour coding has no special significance, and varies from puzzle to puzzle. The stream of comments is specific to the puzzle on the screen. People playing other puzzles cannot see your messages.